Keeping track of everything that goes on can be difficult at a place where people of all ages are coming and going throughout all times of the day, whether it's students, professors, maintenance staff, or administration. 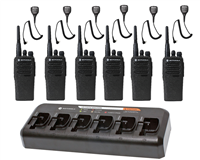 Not only are two way radio walkie talkies one of the most reliable safety precautions for schools by helping security officers work as a team, communicate quickly in times of danger, and stay on top of where things are taking place, they also enhance communication for administrative staff, maintenance workers, and the janitorial team. Utilizing multiple channels will let your janitorial staff stay on top of keeping the campus clean so that your administrative team can focus on their own needs. Should one group need to talk with another, they simply turn a knob and have push-to-talk communication. Notifying everyone of emergencies or help requests quickly and employees knowing where and how they are needed are made much easier with two way radio communication.